Music games became particularly popular in the late 90s and early 2000s, with titles like Dance Dance Revolution or Beatmania by Konami, PaRappa the Rapper by Sony, the original Donkey Konga Nintendo or different and always Sega bold bets as Space Channel 5, Samba de Amigo or Rez. But despite having some of these proposals with some success, especially in Japan, it was not until the arrival of Guitar Hero and its competitor, Rock Band, when madness unleashed in the US and Europe, and our homes are filled with plastic guitars that made us feel for a few minutes as genuine rock stars. The outcome of this story is known by all, and after three or four years that Electronic Arts and Activision especially swelled to sell games and peripherals, puncturing the bubble ended surprisingly quickly and rapidly. Suddenly video games like Guitar stopped, and both Guitar Hero and Rock Band disappeared from the map, so far. This year, almost as if they had agreed, they will come back, albeit somewhat differently. The new game from Harmonix announced last March, as its name suggests - Rock Band 4, will go for continuity, by providing more and better of the same, and so much so that will be compatible with all songs from the previous installments and their peripherals. Instead the return of Guitar Hero will be very different, and will try to offer something new, both visually and in gameplay, so at first it seems that both games can have their own space, to have different approaches. A few weeks ago we traveled to London to see and try for the first time the new Guitar Hero Live, and we must admit that we were surprised by what we found, as it plays and looks very differently from previous Guitar Hero. Nothing's been nothing less than five years from the last delivery, and their creators, FreeStyleGames British – responsible for the failed DJ Hero - have thought that the time was not reason enough to rekindle the flame games guitar, and have decided to offer something different, coming both consoles and portable devices, as they send the current canons. Guitar Hero Live has a more realistic approach, and if the goal of this type of music games always making us feel a real rock star, now this has a literal sense, and play from a first person perspective and videos of real image none of polygonal graphics. Gone is the cartoon look and casual previous Guitar Hero, and now they want to feel firsthand the warmth, excitement and adrenaline of live music, where you can enjoy and rock really lives. For hitting the tension in the body, before we get to play walk the path from backstage to the stage, with the sound of thundering increasingly public, while the guitar player and presence placed a lot of curious details of all paraphernalia surrounding a rock concert, almost a ritual. Once on stage the members of our group give us a knowing look, then we know that everything is ready to start the show. Before detailing how the new way of representing the actions, which has seemed spectacular, we must talk about the big star of the show: the new guitar. This has six buttons on the mast, all accessible from one hand without having to move the guitar, so the gameplay changes considerably. If you were of those who hated the fifth button of the old Guitar Hero, that many players are choked, you're in luck. If instead you loved the old way of playing, and think that not having to move the hand up the mast will make it easier, you have to know that this is not so. If you so wish, Guitar Hero Live can be devilishly difficult as six buttons give to a host of complicated combinations. The notes down on the screen for three columns, and each can be white or black -six buttons, or both at once, giving a lot of combinations. Obviously we must learn to play again. But there comes a time when something makes you "click" on the head, enter fully into the new mechanics, and realize their full potential. It is impossible to explain it in words, just try to understand it, but it's a more accessible gameplay first, but the more profound and complex for the most skilled players ever, there are many more combinations. Clearly not be liked by everyone, and sure many fans of previous Guitar Hero will complain bitterly about this change, but we must admit that they have achieved their purpose, you have the feeling of playing with something new, and not more of the same. If we get tired of this gameplay five years ago, is smarter than this return have strived to offer something different, that even for curiosity, lovers of music and especially of rock certainly want to try. This feeling is reinforced by its daring and renovated graphics, with real image. This use for a video game FMV (full motion video), more than one you will sound dated to the time of Mega-CD Sega, but we did not know is how advanced the technology, and what can be achieved today, it's spectacular. During the song depending on how well or how badly do the public and members of the band reaction accordingly in real time. For example if you do wrong, the public is cooled, discouraged, and we can get to boo, as the singer or drummer kick us dirty looks, to let us clear that we are spoiling the performance. However if you play well the public gives everything, people mad, and looks of the components of your band are of admiration, approval, good vibes. All this happens in a dynamic and transparent way, you don’t notice the transitions, and has done a fantastic job in this regard, in addition to exquisite quality video. Surely when we played a few hours and have seen all the changes in this new video visuals stop surprising, but at least now, as an introduction, it seems very attractive. 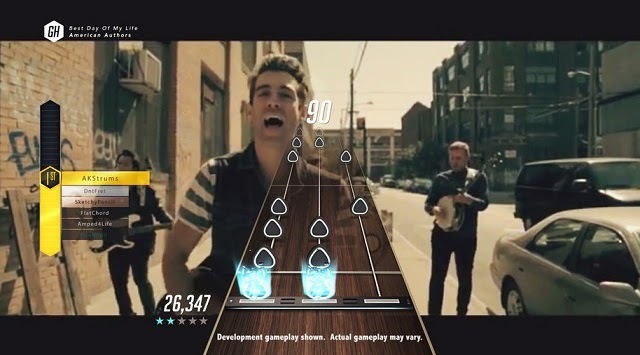 This was a first contact with Guitar Hero Live, and there are many details released in the coming months, but already we have noticed that in terms of number of songs there is nothing to fear, we will be in similar numbers to those of the best deliveries, and in any case we will have a full store where we can buy our favorite topics. Obviously not all songs have its video in the first person, and many of the themes of the store's enjoy the actual video of the group, which is not bad. They have also made it clear that this return of Guitar Hero is fully focused on the guitar, so you may not have other instruments at least for now. And as we imagine will have a new way to play, a new guitar, implies that the old instruments will not be supported, nor are the songs. Something we'll see how the community is taken because it is completely the opposite of what it offers Rock Band 4 , in which you'll be able to use everything that had previously purchased, both the songs and instruments. We loved the return of Guitar Hero, and we could play has left us wanting more. We think its great new look, new gameplay feels like something different and fresh, it works, and it seems that five years have been enough to feel like we pick the guitar again. We assume that they have learned their lesson and will no longer fall into the same mistakes of the past, but will have to see if the market has really feel like music games, and come to stay. Many unknowns about this return, but also eager to return to feel a rock star in the living room of our house.